Dentures are a type of dental prosthetic that mimics the beauty and fullness of a real smile. If you are missing an entire arch of teeth or are going to be having more teeth removed due to decay or periodontal disease, a plate of dentures can help give you back your smile in a comfortable and convenient manner. A denture is a prosthetic that can be worn throughout the day and gives the illusion of a full, beautiful smile. Dentures are custom-made to match each patient’s smile so that you’re getting an appliance that looks and feels completely natural. You will need to remove the dentures at night to soak in order to disinfect and clean them. Dentures can be fully removable, or you can get them permanently placed, just as if it were a dental implant. Some dentures are not full mouth dentures and are known as Partial Dentures. With partial dentures, a metal framework will house the dentures and attach to your natural teeth. Partial dentures offer a removable alternative to bridges, which are permanent. 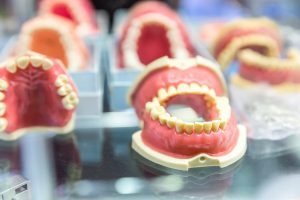 It is always best to visit the dentist to determine what type of denture is best for you. If you want to inquire more about dentures, contact us today at Ascent Dental Group and one of our helpful staff members will be happy to assist you!